Gastric bypass surgery is a bariatric procedure designed to limit the amount of food you can eat and, in turn, help you to lose weight. According to MayoClinic.com, gastric bypass is the most frequently performed bariatric surgery because it has fewer complications and it can give you long-term weight loss if you eat right and exercise. After bypass surgery, building muscle is important to preserve muscle and boost your metabolism. Lift weights three times per week for 30 minutes per session to build muscle. Start with easy moves and light weights. Beginners should focus on working out the entire body with compound moves such as the squat, deadlift, bench press and rows. Compound exercises enable you to work multiple muscle groups during one lift. Increase the amount of weight you lift as you get stronger and your workouts feel easier. By performing lower repetitions and weights that are close to the most you can lift, you will build more muscle size and strength. Performing high repetition sets with low weights will help you develop lean, toned muscles. Stretch before and after your workout to prevent injury and boost flexibility. Stretching will decrease the soreness and increase your range of motion. 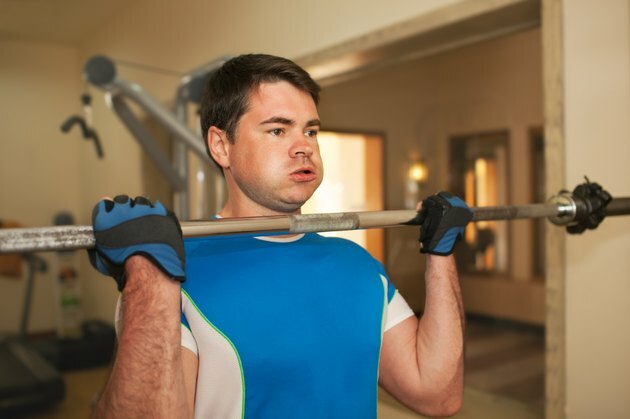 Perform cardiovascular training or aerobic exercise after you lift weights or on days when you are not lifting weights. Cardio training like running, jogging or aerobics is designed to burn fat and help you lose weight, but it can hamper your muscle building goals. Bodybuilding.com says that you want to have as much energy as possible during weightlifting to build muscle and cardio saps some of the energy away.